Alterations to the predevelopment delivery of water and nutrients into the Everglades of southern Florida have been occurring for nearly a century. Major regional drainage projects, large-scale agricultural development, and changes to the hydrology of the Kissimmee River-Lake Okeechobee watershed have resulted in substantial phosphorus transport increases by surface waters. Excess phosphorus has accumulated in the soils of northern Everglades marshes to levels that have impaired the natural resources of the region. Regulations now limit the amount of phosphorous that enters the Everglades through an extensive network of water-control structures. This study involved the development and application of water-quality modeling components that may be applied to existing hydrologic models of southern Florida to evaluate the effects of different management scenarios. The result of this work is a spatially distributed water-quality model for phosphorus transport and cycling in wetlands. The model solves the advection-dispersion equation on an unstructured triangular mesh and incorporates a wide range of user-selectable mechanisms for phosphorus uptake and release parameters. In general, the phosphorus model contains transfers between stores; examples of stores that can be included are soil, water column (solutes), pore water, macrophytes, suspended solids (plankton), and biofilm. Examples of transfers are growth, senescence, settling, diffusion, and so forth, described with first order, second order, and Monod types of transformations. Local water depths and velocities are determined from an existing two-dimensional, overland-flow hydrologic model. The South Florida Water Management District Regional Simulation Model was used in this study. The model is applied to three case studies: intact cores of wetland soils with water, outdoor mesocosoms, and a large constructed wetland; namely, Cell 4 of Stormwater Treatment Area 1 West (STA-1W Cell 4). Different levels of complexity in the phosphorus cycling mechanisms were simulated in these case studies using different combinations of phosphorus reaction equations. Changes in water column phosphorus concentrations observed under the controlled conditions of laboratory incubations, and mesocosm studies were reproduced with model simulations. Short-term phosphorus flux rates and changes in phosphorus storages were within the range of values reported in the literature, whereas unknown rate constants were used to calibrate the model output. In STA-1W Cell 4, the dominant mechanism for phosphorus flow and transport is overland flow. Over many life cycles of the biological components, however, soils accrue and become enriched in phosphorus. Inflow total phosphorus concentrations and flow rates for the period between 1995 and 2000 were used to simulate Cell 4 phosphorus removal, outflow concentrations, and soil phosphorus enrichment over time. This full-scale application of the model successfully incorporated parameter values derived from the literature and short-term experiments, and reproduced the observed long-term outflow phosphorus concentrations and increased soil phosphorus storage within the system. A global sensitivity and uncertainty analysis of the model was performed using modern techniques such as a qualitative screening tool (Morris method) and the quantitative, variance-based, Fourier Amplitude Sensitivity Test (FAST) method. These techniques allowed an in-depth exploration of the effect of model complexity and flow velocity on model outputs. Three increasingly complex levels of possible application to southern Florida were studied corresponding to a simple soil pore-water and surface-water system (level 1), the addition of plankton (level 2), and of macrophytes (level 3). In the analysis for each complexity level, three surface-water velocities were considered that each correspond to residence times for the selected area (1-kilometer long) of 2, 10, and 20 days. Various of model outputs were studied that could be potentially useful to the model user: surface-water soluble reactive phosphorus (SRP) outflow, soil pore-water SRP variation, soil organic accretion, soil adsorbed phosphorus, plankton outflow, and macrophyte variation. Results show that a simple soil pore-water and surface-water system modeled with and without plankton exhibits little change in sensitivity, owing to the plankton-based processes. Effects in both cases are primarily linear (additive), and the degree of interactions among parameters is minimal. The sensitivity ranking of the parameters, however, changes with the introduction of plankton-related modeling processes, because the plankton growth parameters dominate the simulated response of the system for most outputs studied. The introduction of macrophytes substantially alters the parameter sensitivity, tempering much of the linear effects and generating nonlinear interactions among all components. Although it is possible to reduce the number of important parameters to about half of the total model parameters for levels 1 and 2, the presence of interactions prevents such simplification for level 3. Among the important parameters for level 1, the organic soil oxidation rate, kox, was consistently ranked most important followed by three other parameters: diffusion coefficient, kdf, soil bulk density, pb, and mass fraction of phosphorus in organic soil, XsoP. These results agree well with current understanding of the physical system, because the principal source of new phosphorus to the level-1 system is from oxidation of the soil (controlled by kox) and the pore-water SRP and, hence, the adsorbed phosphorus is controlled by the other three parameters. The SRP in the water column is more sensitive to kdf because this parameter represents the limiting process of diffusion through which the surface water gains new phosphorus. These trends across outputs persist in the level-2 results, with the only notable difference being the prominence of plankton growth parameters in the ranking for mobile outputs (outflow of surface-water SRP and plankton biomass). Level-3 results do not exhibit any pattern of parameter dominance across the different outputs. Model sensitivity to velocity is correlated with model complexity; that is, as velocity increases, the model sensitivity to the important parameters changes the most for the most complex case. The complex interactions that occur in level 3 complicate the process of identifying sensitive parameters with the Morris screening method. This technique, however, was found to be computationally efficient for qualitatively evaluating global model sensitivity and linear or nonlinear effects of important parameters. In cases where many parameters appear to be important, as when interactions predominate, the extended FAST method provides quantitative measures of the linear and nonlinear contributions of each parameter to the observed global output variance. 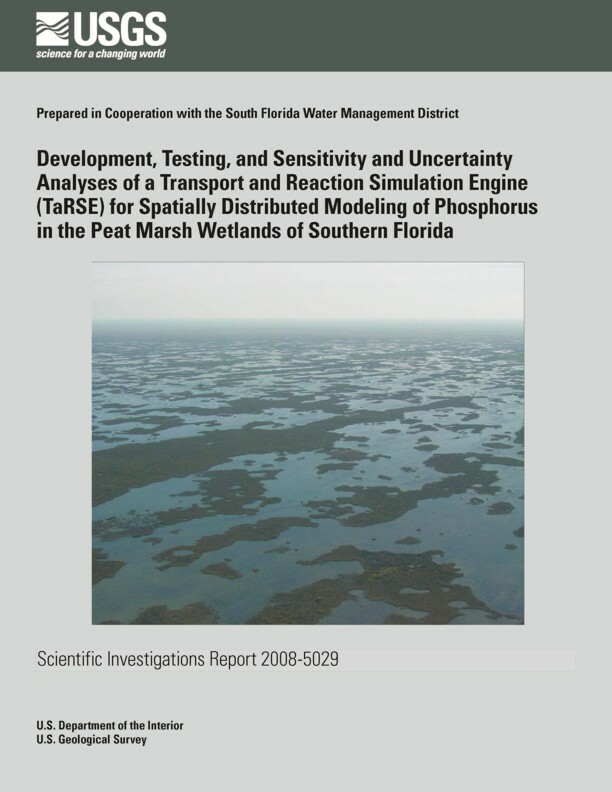 Jawitz, J.W., Muñoz-Carpena, Rafael, Muller, Stuart, Grace, K.A., and James A.I., 2008, Development, Testing, and Sensitivity and Uncertainty Analyses of a Transport and Reaction Simulation Engine (TaRSE) for Spatially Distributed Modeling of Phosphorus in South Florida Peat Marsh Wetlands: U.S. Geological Survey Scientific Investigations Report 2008-5029, 109 p.